Back in June I posted a PR release for this, and mentioned that tasting notes were hopefully soon to follow. Well, the guys at William Grant & Sons were kind enough to send me a (generous) sample, so here it is. Nose: Rich and nutty, with a hint of...cucumber? Vanilla and oak influence and just a hint of smoke. Honey but not overly pronounced. Palate: Rich, creamy. Huge mouthfeel initially (not dissimilar to the Balvenie 15yo) but seems to vanish quickly, leaving a lighter, fruitier taste. Notes of honey. Finish: Lingering, oaky, with the honey lingering longer than any of the other notes. Rating (on my very non-scientific scale): 92/100. Balvenie have once again produced a stunning dram, and it's fantastic that it's now available in Australia. I would love to see it at 46-48% ABV though - I think with a bit more longevity on the palate, it'd be up around 94-95points. One thing I love doing with my glass is nosing it 15 or so minutes after the whisky is all gone. 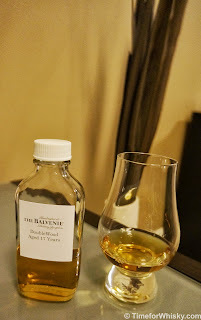 EVERY single Balvenie I've tried has left the most amazing aroma in the glass, and this one is no exception. Rich, honied, stunning.